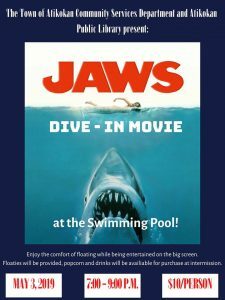 The Town of Atikokan Community Services Department and the Atikokan Public Library present: Jaws Dive-In Movie. Enjoy the comfort of floating while being entertained on the big screen. Floaties will be provided, popcorn and drinks are available for purchase at intermission.